(Nanowerk Spotlight) Coating metallic nanoparticles in boron nitride could lead to new biomaterials for medical research and applications as well as high frequency nanoscale electromagnetic devices. Boron nitride (BN) is a synthetic white solid material which remained undeveloped as a commercial material until the latter half of the 20th century. Boron and nitrogen are neighbors of carbon in the periodic table (in combination boron and nitrogen have the same number of outer shell electrons) and the atomic radii of boron and nitrogen are similar to that of carbon. It is not surprising, therefore, that boron nitride and carbon exhibit similarity in their crystal structure. Boron nitride can be synthesized in hexagonal and cubic forms. Cubic boron nitride (c-BN) has the same structure as diamond and its properties are similar. Indeed, c-BN is the second hardest known material, next to diamond. Recently, BN nanomaterials, such as clusters, nanocapsules, nanohorns and nanotubes, have been discovered and extensively studied. These BN nanostructures are expected to be useful as electronic devices, field-effect transistors, high heat-resistant semiconductors, insulator lubricants, nanowires, magnetic nanoparticles and gas storage materials. If an application requires metal nanoparticles to be protected from oxidation or wear, the particles are usually encapsulated in organic or inorganic materials such as carbon, silica or polyethylene. Due to its carbon-like properties, BN nanomaterials provide excellent protection against oxidation and wear, and they are electrical insulators. Therefore, magnetic nanoparticles coated with BN layers are very attractive candidates for applications such as MRI imaging or magnetic data storage. So far, magnetic nanocapsules coated with BN layers have been synthesized by the arc-discharge method, where an electric arc is formed between two electrodes. However, the arc-discharge method is not suitable for mass production because of the limitation of the plasma area, and it is difficult to control the particle size and the number of BN layers. For any application to be commercially viable, low-cost and large-scale production methods have to be developed. Researchers in Japan now developed a new thermal annealing process, with a new combination of materials, for Fe or Co nanoparticles coated with BN layers in large quantity. 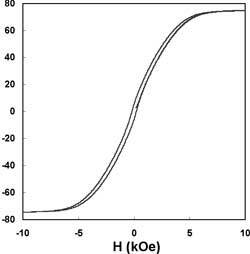 Their findings will be published in a paper titled "Synthesis and magnetic property of boron nitride nanocapsules encaging iron and cobalt nanoparticles" (article in press) in Journal of Physics and Chemistry of Solids. Takeo Oku an Associate Professor at the Nanoscience and Nanotechnology Center at Osaka University, wrote the paper together with his colleague Ichihito Narita, and Hisato Tokoro from the Advanced Electronics Research Laboratory at Hitachi Metals. 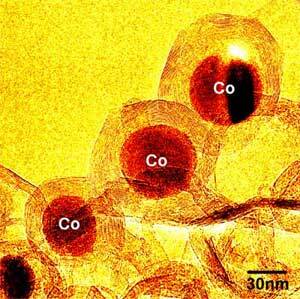 "In our work, we produced highly dispersed BN nanocapsules encaging Co nanoparticles. No oxygen was introduced in the synthetic process, which would be useful for mass production of BN nanocapsules with magnetic properties" Oku, lead author of the paper, explained to Nanowerk. "Our present work provides a new process for Fe or Co nanoparticles coated with BN layers in large quantity compared to an ordinary arc-discharge method" says Oku. "These BN-coated nanocapsules exhibited a soft magnetic characteristic and good oxidation resistances. They could for instance be used to reduce the electromagnetic fields produced by cell phones."